These days, the people of the Philippine islands know how to speak English despite little or no education at all. Years ago, this was not the case. Why the colonizers of the Philippines during the 15th Century insisted on speaking to the natives as though there was no language barrier is a mystery, evident in the funny names some of our islands have today. 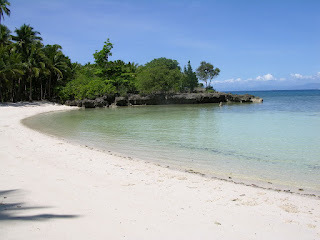 Take, for example, Camotes Islands in Cebu. Local story has it that the Spanish travelers who came to the islands asked some farmers what the name of their island was. Clearly not understanding what they were saying, the farmers told the Spanish about the camote, a sweet potato, that they were harvesting on that day. Camotes Islands is separated from the main city of Cebu by sea. Getting there, one will need transportation via fast craft, pump boat or a ferry. The fast craft can take the tourist to their destination in 2 hours or less for a price, while the pump boat’s travel time follows closely behind only delaying depending on the weather conditions. The ferry boat is most accessible with its pier located near historical monument Plaza Independencia, but the travel time takes almost 4 hours. There are four municipalities scattered among Camotes Islands namely, Poro, San Francisco, Tudela, and Pilar. Poro is where you want to take a day trip during the weekend of the Sinulog Festival as they have their own festivals in the 3rd week of January in honor of the Sto. Niño, or you can take a vacation to one of their pristine beaches like Buho. The month of March offers a list of things to do for the traveler. The islands celebrate the feast day of St. Joseph with such town-wide activities as a mountain bike challenge and the Soli-Soli Festival. (Soli-Soli is a type of long grass that is harvested to weave into local products.) Year-round, Camotes Islands keeps their beaches and trails tourist-friendly while tours of the scenic Lake Danao as well as Timobo and Bukilat Caves lay in wait for those seeking a little bit of an adventure. You've made some really good points there. I checked on the web for more information about the issue and found most individuals will go along with your views on this web site.